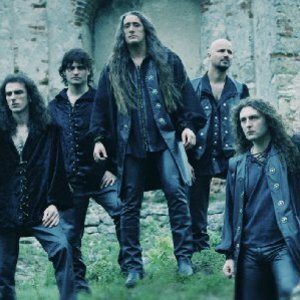 Rhapsody of Fire is the new name of Italian symphonic power metal band Rhapsody. The name change was announced on July 14th, 2006. Read the following statement made by the webmaster: "Due to copyright and trademark issues the band formerly known as Rhapsody has changed its name. The band members consider this a great new start, reflecting the emboldened and increasingly grandiose direction that their music has taken. "Due to copyright and trademark issues the band formerly known as Rhapsody has changed its name. The band members consider this a great new start, reflecting the emboldened and increasingly grandiose direction that their music has taken. ?The power of the dragonflame will burn brighter than ever before,? says guitarist/songwriter Luca Turilli. Keyboardist/songwriter Alex Staropoli adds, ?The name Rhapsody Of Fire better represents the energy that has always been present in this band and its music.? With a new record company in Magic Circle Music, a new tour planned and a new album on the way, Rhapsody Of Fire will continue to explore musical fantasy worlds with the precision musicianship and unique symphonic concepts that their fans have come to expect and adore. Fresh on the heels of the band's first live album release, Live In Canada 2005 - The Dark Secret, a new name and renewed vigor ensure that Rhapsody Of Fire still hold the passion and power that have always been associated with their music." It's confirmed that they will releasing an album on April 30, 2010, called "The Frozen Tears of Angels". It is the first album to be released after a long hiatus, caused by a legal dispute with the band's previous label, Magic Circle Music.